THIS is a story of the pioneering of motor transport, beginning at Doncaster in Victoria delivering fruit in the 1940s. After World War 2, Ed Cameron and his brothers were the driving force began regular deliveries of produce from Melbourne to Sydney. They formed the D&E Cameron transport company, to battle the primitive Hume Highway. Frustrated by the inadequacies of the available European and British trucks, Ed found the solution by importing the first Kenworths to Australia. It was through his efforts that Kenworth set up at Bayswater in Victoria, to produce trucks custom-built for Australian long-haul transport conditions. D&E Cameron ceased operations in the 1970s, but the name continues as Ed's son runs the very successful Glen Cameron Group, as one of Australia's leading transport operations. 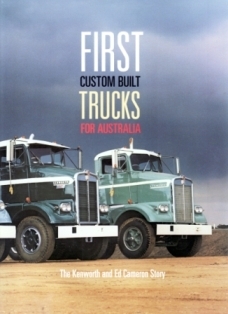 In this book, Ed Cameron tells the Kenworth story against the background of his family history, and the diversity of his interests following his life on the roads.